After a quick trip across the High Bridge to the Station East (disappointing) and By The River Brew Company (expensive but good), I finished my night at this Quayside pub that I had passed by a number of times previously. Just 2 ales were on - Sharp's Doom Bar & Tyne Bank Coco Rouge Noir, a coconut and raspberry porter. The latter was quite pleasant. Live 20/20 cricket was on the TVs. It's clearly a popular place for sports fanatics. A nice place. 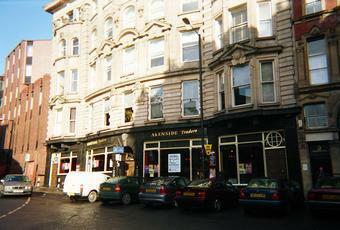 But, there's plenty of other great pubs in this area. Cheap and cheerful, lively establishment, limited range of ales, but decent enough service, cheap food, does what it says on the tin. What a strange place. On the surface a great place to get together and watch the sport. Until you taste the lager (apologies, I was on a stag weekend) that tastes distinctly watered down. Dodgy. Then you go to the gents and see the toilet attendant selling packs of chewing gum for a tenner than need to be 'consumed' in the cubicles... draw your own conclusions. I wont be going back, plenty of better places. Not a great experience. Wouldn't bother with such good competition! Has served real ales for a while now from local breweries (Consett, Sonnet 43, Mordue etc.) and nationals (Marstons). Worth a look in if you're passing.